Did you know that the sense of hearing is vital to good balance function? While we usually think of vision and touch as integral to balance, hearing also plays a major role. The embryologic development of the inner ear gives us clues to the relationship between hearing and balance. Hearing is the first sense to develop with the organs of balance. Anatomically, the end organs of balance are connected to the organ of hearing called the cochlea. Together the cochlea and balance organs comprise the structure known as the inner ear. Both hearing and balance organs are innervated by separate branches of the same cranial nerve. Balance function is extremely complex as it integrates information not only from hearing but also from vision and touch sensors to allow us to orient ourselves in space. Until recently most evidence of the relationship between hearing and balance has been anecdotal. Pediatric occupational and physical therapists have observed that young children who have balance disorders often have greater difficulty understanding speech in noise and more difficulty localizing sound around them than their peers with good balance function. Audiologists have also noted that hearing impaired adult patients often complain of balance problems. In recent years there has been research providing evidence of the importance of hearing to balance function. An important study from Johns Hopkins was conducted from 2001 through 2004 that correlated hearing loss with fall risk among adults. Study participants who were 40 to 69 years old had tests of hearing and balance function and were interviewed regarding their history of falls. Results revealed that those individuals who had even a very mild degree of hearing loss were nearly 3 times more likely to have a history of falling than their normal hearing peers. An additional finding was that for every 10 decibel increase in hearing loss the likelihood of falling increased by 1.4. The authors proposed that hearing loss caused an increase in cognitive load by decreasing awareness of one’s surrounding environment; thereby, increasing the likelihood of falling. Both hearing and balance functions tend to decline with age. Now that hearing loss has been correlated with balance problems, specifically with fall risk, what can be done to mitigate the risk of falling as we age? Physical therapy has been known to improve balance but the improvement may be limited if we ignore a coexisting hearing loss! A study published in the medical journal Laryngoscope in 2015 evaluated balance function of hearing impaired adults with and without their hearing aids. Results showed that the study participants improved their balance performance significantly when their hearing aids were turned on in comparison to their performance with hearing aids off. A similar study from Oregon Health Sciences University in 2015 compared balance function of hearing impaired adults with and without hearing aids or cochlear implants. This study also examined differences in balance function of individuals using unilateral versus bilateral hearing aids or cochlear implants. The results revealed that adult participants showed a significant improvement in balance performance when using bilateral hearing aids or cochlear implants compared to the unaided or unilateral aided conditions. The authors concluded that bilateral hearing aids or cochlear implants can be considered to be balance rehabilitation devices! 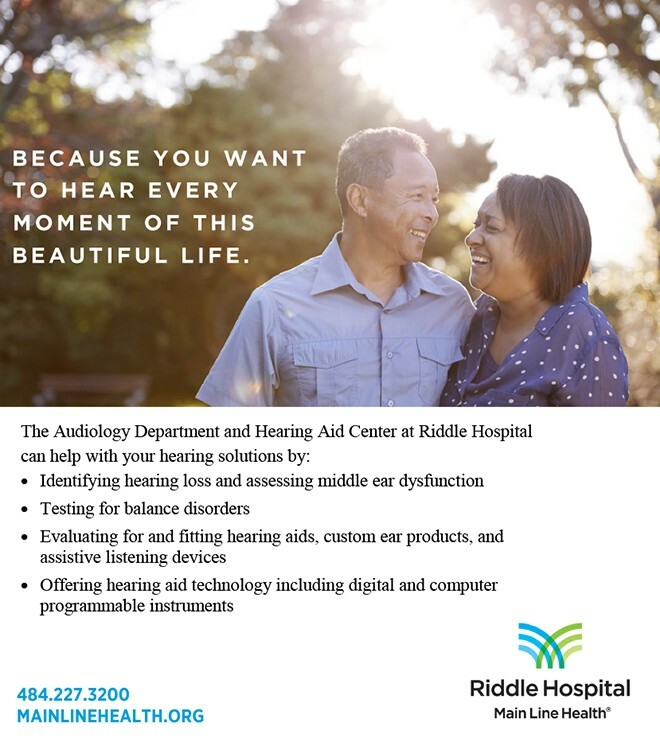 The audiologists at Riddle Hospital, part of Main Line Health, have many years of experience helping those with hearing and balance disorders. We understand how vital good balance function and the sense of hearing are to your quality of life. Our mission is to improve your quality of life by providing you with the tools for better hearing and balance. If you suspect that you have hearing or balance problems, do not ignore it. There is hope and help for better hearing and balance at Riddle Audiology!